Karvansaray Hostel v Baku, Ázerbájdžán: Zarezervujte nyní! 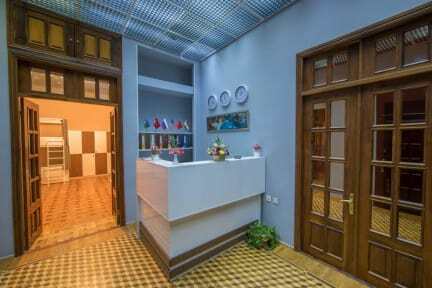 Dear friends, recently renovated Karvansaray Hostel is at your disposal anymore. With 26-person bed numbers (double, single and two-storey bed), separate bedrooms and bathrooms for women and men so these conditions will make our guests more relaxed. The beds are larger than the standard sizes and are supplied with orthopedic mattresses. Moreover, there is an entertaining room which can be used by our guests. In here guests can spend their leisure time more efficiently by playing chess, dominoes, OK, Playstation 4 or reading books in our library. In the Hostel guests who arrive for permanent or temporary staying can freely use our kitchen. In accordance with our guests' wishes , they can cook themselves or we would love to cook for them the coveted dish.